GramLat® 3D Lattice™ is the ONLY genuine double-sided, 3 Dimensional Prepainted Steel Lattice™ that was introduced into the market in 1999. The slats are rollformed into an exclusive profile that is an Australian registered product of GramLine® (Registration No. 141018S). The GramLine® brand is embossed on the lattice for peace of mind and traceability. The GramLat® 3D Lattice™ panels matches the appearance of traditional timber lattice but has the advantages of being pre-painted, low maintenance and termite resistant and has the same life expenctancy as the privacy steel fence. 1. Lattice Edge Covers – covers the sharp edges of the Lattice creating safety. It is mostly used for decorative friezes. 2. SlimLine™ framing system – consist of the SlimLine™ channel post & rails. It is the ultimate solution creating a heavy duty frame. 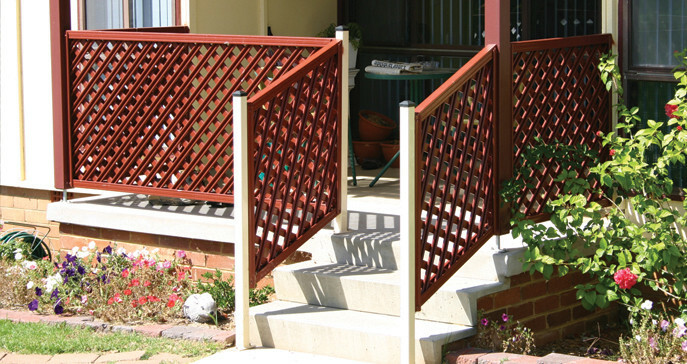 The GramLat® 3D Lattice™ is available in the full GramLine® Steel Privacy Fencing colour range. It’s unique design gives you the opportunity to purchase single or dual colour slats to complement the style and colour scheme of any home. View GramLat® 3D Lattice™ sizes chart. Please download our GramLat® 3D Lattice™ Flyer.